The Catholics in Media Associates (CIMA) has announced the winners for the 19th Annual CIMA Film & TV Awards. 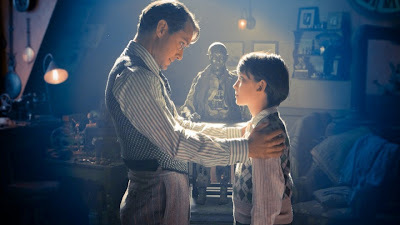 The CIMA Motion Picture Award will be given to Martin Scorsese's Hugo, the 3D adventure drama based on Brian Selznick's novel The Invention of Hugo Cabret. The film won five Academy Awards and was named Best Picture by the National Board of Review. The Documentary Award will go to Tom Shadyac's I Am. Although primarily known as a director of comedies such as Ace Ventura: Pet Detective, Liar Liar and Bruce Almighty, Shadyac suffered a cycling accident that left him confronting his mortality. I Am is his first-person exploration of two key questions: what’s wrong with our world, and what can we do to make it better? Their Board of Directors Award will be presented to Emilio Estevez' The Way, which stars Martin Sheen who previously won a CIMA Lifetime Achievement Award. The film is a story about a man retracing the pilgrimage route on the Camino de Santiago where his son died. 2012 CIMA Television Award will go to ABC's Modern Family, created by Executive Producers Christopher Lloyd and Steven Levitan. It stars Ed O'Neill, Sofía Vergara, Julie Bowen and Ty Burrell, and has won numerous previous awards including Emmy, Golden Globe and Peabody awards. The former DGA President Jack Shea and his screenwriter wife Patt Shea founded the CIMA Awards in 1992 with some fellow Catholics in the industry. They were created promote and recognize "films, television programs and other entertainment forms that lift the spirit and help us better understand what it is to be part of the human family." The 2012 CIMA Awards will be presented at the 19th Annual Mass and Awards Brunch on Sunday, April 29th at the Beverly Hills Hotel, Beverly Hills, CA.